Do you have young children? Do you want to make reading more exciting for them? Do you want to have a fun family outing that involves, books, music, and more?!? Then make sure you head over to the Early Childhood Literacy Fair at the Erlanger Branch of the Kenton County Public Library on Saturday November 20th! Take a minute to read the press release below, it sounds like it’s going to be a fun & exciting day for the whole family! My kids love to read, and we love dancing along to music by Jim Gill & David Kisor, and I do believe your children will have a blast too! When: Saturday, November 21 from 12:30-4 p.m. The Kenton County Public Library and the Kenton County Community Early Childhood Council will host the Sixth annual Early Childhood Literacy Fair on Saturday, November 20 from 1-4 p.m. at the Erlanger Branch Library at 410 Kenton Lands Road. 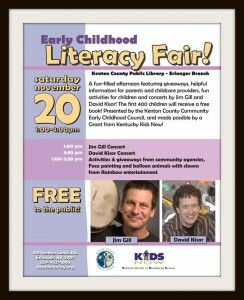 Young children and families will enjoy concerts by Jim Gill and David Kisor, fun activities, face painting and a FREE book for the first 400 children! Children will love Jim Gill, a Parent Choice award and American Library Association award winner. Anyone who has ever attended one of Jim’s family concerts knows that rather than performing for the children and parents, Jim leads them to sing and play together. David Kisor performs at the Mary Ann Mongan Library in Covington a few times a year! He is an accomplished singer, songwriter, composer, performer and teacher. 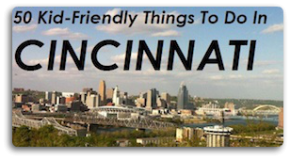 He is presently the Music Director for Children, Inc. in Covington, Kentucky, serving Northern Kentucky families with preschool and elementary age children. He also serves as Creative Director for Growing Sound, leading the songwriting, recording and performing of musical products to teach social-emotional development. 1-3:30 p.m. Activities and giveaways from community agencies, face painting and balloon animals clowns from Rainbow Entertainment. The free fair is funded by a grant from the Kentucky KIDS NOW initiative. Visit www.kentonlibrary.org for more information. The Kenton County Public Library has three locations – Covington, Erlanger and Durr in Independence. The library is consistently one of the top ranked public libraries in the state of Kentucky and served more than 1.1 million visitors last year. The library also provides more than 4,000 free educational, informational and recreational programs and training classes annually. Learn more at www.kentonlibrary.org.